In both cases I resisted the characterization. 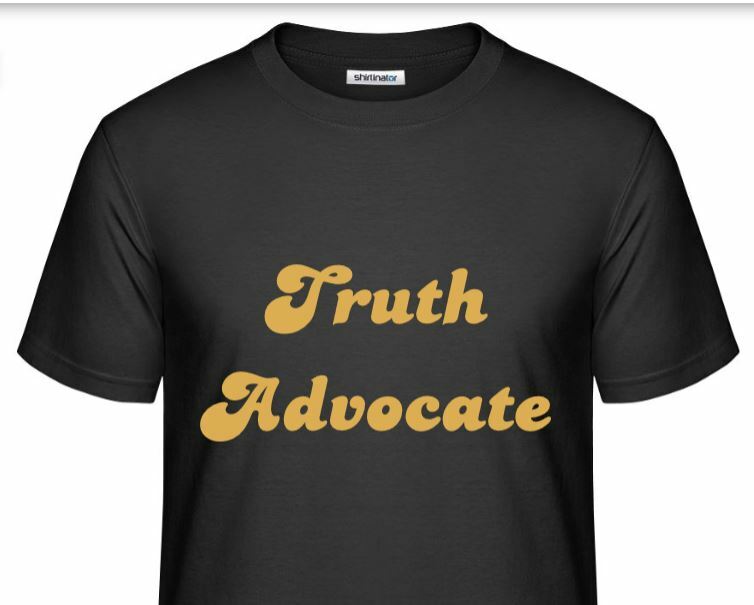 Here’s the thing: I don’t see myself as a “gun advocate” or my work as “pro-gun.” As a social scientist, I am a TRUTH ADVOCATE and my work is PRO-TRUTH. What I write about guns is based on my search for truth, not a political position on guns. If there are political implications of my work, I will let others draw them. By contrast, in the conclusion to my forthcoming book chapter on “Understanding and Misunderstanding American Gun Culture,” I wonder whether social scientists’ excessive focus on guns only from criminological and epidemiological perspectives is driven by a political interest in gun control, rather than the opposite. I have spent the past 30 years (3/5ths of my entire life!) training to be and practicing as a social scientist. I am the last person who would try to undermine the credibility of social science, either from the perspective of the post-modern left or the populist right. But gun control motivated and anti-gun researchers play a role in undermining their own credibility with people who do not share their fundamental views of the role of guns in society. Although you can’t hold scholars responsible for how their work is represented by the media, a recent story in Scientific American about guns and crime illustrates what I believe is a symbiosis between gun control motivated researchers and the media that covers them. The author wants to establish the point captured in the headline above. Although she tries to give the appearance of objectively examining the issue (“evidence shows”), she cannot help but betray her biases throughout the story. 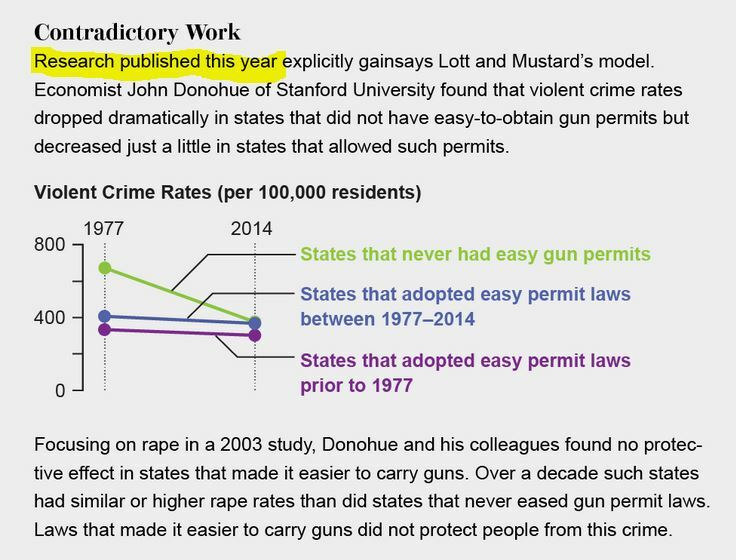 Consider the portrayal of research that contradicts Lott and Mustard’s work on guns and crime (i.e., the “more guns, less crime” hypothesis). I have attempted to read some of this work, and it is extremely complex and there are no definitive conclusions at this point, either way. The Scientific American author invokes an article by Lott’s critic John Donohue. Fair enough. It provides an alternative to Lott, but is far from definitive, as A.C. Haskins has shown on his Antistupid Project blog. And yet in the credits for the figure shown above, it clearly shows that Donohue’s is a “Working Paper” posted (not published) on the National Bureau of Economic Research website. The fact that a writer for Scientific American does not know the difference between published research and posted working papers does not inspire confidence. The bias shines through again in the section of the story on defensive gun uses (DGUs). This issue, like the “more guns, less crime” debate, is complicated and I know of no definitive research on how many DGUs there are in the United States and what they look like. I do, however, assign the article on “The Epidemiology of Self-Defense Gun Use: Evidence from the National Crime Victimization Surveys 2007–2011” in my Sociology of Guns seminar and have read it closely several times. Well, that may be true as far as it goes, but it does not go very far. Far more common than people waving their guns around at bar fights, the NCVS “weeds out” any case in which people WERE NOT VICTIMIZED or DID NOT SEE THEMSELVES AS “VICTIMS.” Like my friend who drives a delivery truck locally and used his gun to dissuade someone from entering his truck while he was getting gas one day. 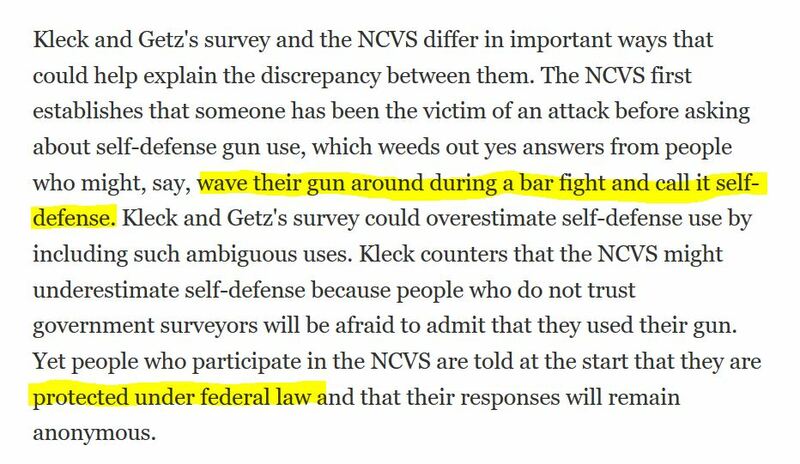 The NCVS also “weeds out” anyone who does not trust the federal government to protect their anonymity. Given the correlation between low confidence in government and gun ownership that I found in my research, those who use guns to defend themselves might be even less likely to appear in the NCVS data. The example used by the Scientific American author is not only unrepresentative and unhelpful, it also betrays a strong anti-gun bias, one which I regret is shared by too many who study guns, who should also be truth advocates rather than gun control advocates. Tags: Defensive Gun Use, gun control, More Guns Less Crime, More Guns More Crime. Bookmark the permalink. Let the facts fall where they may. It’s the credulity of the press that bothers me. Although I suppose it could be simple incompetence at journalism. In the case of Lott, due to his (in my view) overly broad claims for carry, he makes an easy punching bag for people like Donohue to beat up on in a sympathetic press. It’s not like they are going to actually read D’s work, much less the critiques of it (except for Lott’s defenses, which can then be dismissed as self-serving). And since Donohue uniformly only cites to himself, lazy journalists are unlikely to discover the research or critiques by “non-Lott” researchers. I read the Scientific American article and was disappointed. I thought it was written in an unprofessional and somewhat naive manner and thought that the lack of scientific rigor was showing. Like you, I noted that Donohoe’s paper is still at the draft stage, i.e., not peer reviewed, although it is being widely cited as if it were published. I’ll not trash Jon but frankly, I would have treated this as something to be kept inside the academy until it got back from review and was published given that it is politically-relevant science. When I gave a talk on the isotopic composition of the Ontong-Java Plateau and what it said about hot spot formation it did not really affect our society. It just got feathers ruffled in the ivory tower. This work, like other socially-relevant science, has to be fully reviewed so we are as confident as possible of the validity and limits of the study before being used to set policy. One specific question I have is how can one do a controlled study of so many states, i.e., it seems there are no controls! The Hopkins study of CT at least looked at one state and used a number of other states to create the synthetic CT model and was clear about that. I’ve not read too much of the Donohoe study as it is over a hundred pages long but something about it worries me in terms of high confidence. Also, deciding cause v effect is different that establishing correlations. Jon was on the NPR show 1A a couple weekends ago with John Lott. I thought the discussion deteriorated to a certain degree. You are right–this is highly politicized. Until “gun violence” researchers start acknowledging the crime and sociological data on who is actually harming whom, which we already have from multiple sources and which is (should be) apolitical to collect and analyze, controlling for common details within the those sub-groups, instead of crunching numbers as if the problem is evenly distributed, or any given society is composed of identical generic people except for “owns a gun” and “doesn’t own a gun” (much less legally or illegally), there will always be a lot of talking past each other. Ironically, the best way to study, much less impact, “gun violence” is to focus less on the gun and more on the violence itself. Once you identify who is doing what to whom and why, only then you can sensibly look at how, if possible, to keep those particular groups of people, who actually matter to the problem, from getting access to a particular means. Indeed. There is not one America, one rainfall zone, one time zone, or one violence level. Even going from S. to N. Chicago, the murder rate varies by almost two orders of magnitude. So sure, I can understand wanting to interdict guns from getting to gang-bangers or even for that matter, someone with a severe domestic violence problem. But we need to be honest with the stats rather than these vapid comments like “households with guns are more likely to be……”. That is nonsense and ignores the nuance. One might as well say that households with cars are more likely to experience car accidents than households that don’t own cars. Well, of course…..
Agree with both of your sentiments here. To begin with people need to stop lumping homicides and suicides together. Both are bad, but have different causes. Focusing on the gun mechanism as a common cause of both just confuses things. Just look at suicide. Both here and in Japan 70% are men, the majority middle-aged. I’d be willing to bet that’s damn near universal across the “developed world” (defined however one wishes). Now, in the US that cohort is also the most likely to be gun owners and to have the easiest access to firearms (legally or illegally), so they primarily use the firearms they have handy. But to say it is a “gun problem” in the US elides that what we apparently have is a problem endemic and universal to “modern society”. Only by studying how suicide rates have changed over time (if at all), and trying to tie the “why” to quantifiable changes in that “modern society” can we hope to address the actual driving issues. Chasing after some “reasonable gun restriction” that can meaningfully impact that largest single group of suicides in the US without impacting everyone else is a waste of limited resources, an unnecessary infringement. If solving the “suicide problem”, not seeking to justify restrictions qua restrictions, is actually the goal anyway. Prof Yamane, I was typing up my suicide comment while you were posting. Suicide comment? Surely, Matthew…..do we need to confiscate your guns? “In preparation for this report, we performed a systematic metareview of 43 reviews, including over 1,400 studies, to identify what works in reducing community violence. In addition, we supplemented our findings with fieldwork in El Salvador, Guatemala, Honduras, and the United States, visiting over 20 sites and conducting over 50 semi-structured interviews. We found that a few interventions, such as focused deterrence and cognitive behavioral therapy, exhibited moderate to strong effects on crime and violence and were supported by substantial evidence. Somewhat relevant to this discussion is Mike Weisser’s latest blog post. Almost nothing he writes is couched within accepted academic norms and he constantly engages in personal attacks. Professor Yamane I could detect you were after the truth and not coming from a political basis from the first thing I read on this blog. It’s why I keep coming back. This was the first blog I went to to catch up after being off the net over a month after my move. It’s always why I wanted to come audit your class one time as well. Keep up the good work sir.